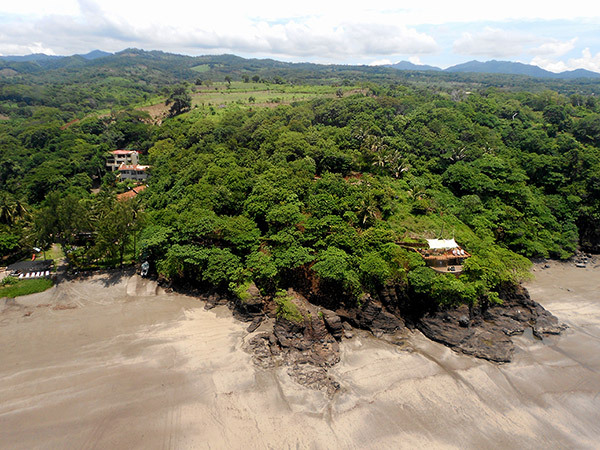 Las Flores Surf Club lies on a stunning 7-acre beachfront property directly in front of the famous surf break and palm tree-lined postcard beach known as Las Flores. Las Flores Surf Club’s pride is its signature break “Las Flores” — a world-class, 300-meter-long, right-going freight train that forms outside the point and peels across the cove up onto the sand just meters from the front of the hotel. 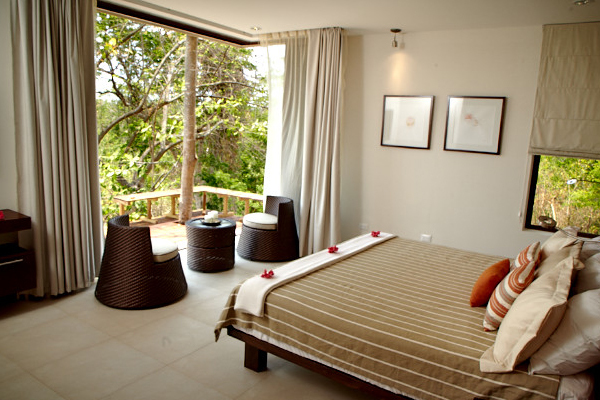 The epic location of the Las Flores Resort directly in front of the wave is without rival in Central America. In combination with the beachfront hotel’s modern facilities and amenities, panga fleet for surfing and fishing the area, in-house surf school and the personalized service of our surf guides and staff, the result is a surf expeditions location that is open year-round. Playa Las Flores is a dramatic, natural cove, hemmed in by severe topography and dense tropical flora, a playful black sand beach bordering a cauldron of whitewater and waves detonating in the background, a throwback in time to a prehistoric vision of Central America where the tropical waters of the Pacific Ocean meet the charcoal sands of ancient volcanic outflows. 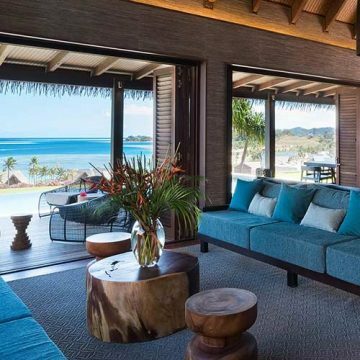 Cast within this primordial setting, Las Flores Surf Club is an environmentally conscious hotel designed to have a minimal impact on the landscape and ecosystem. 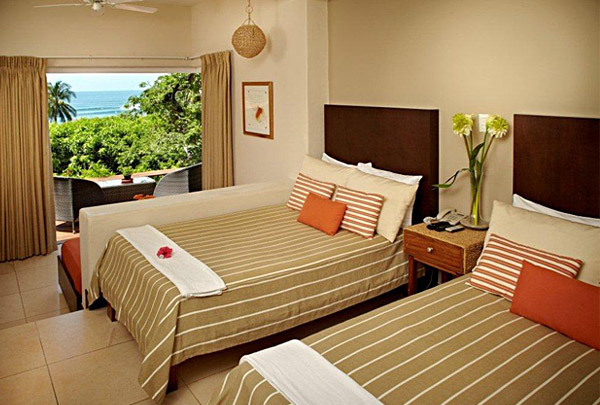 The hotel features 15 ocean view guest rooms and suites with modern architecture and progressive design. The variety of accommodation can meet the needs of a diverse range of guests including singles, couples, families and groups with configurations ranging from 1 to 4 beds each. Current guest capacity is approximately 38 adult guests with the ability to handle exclusive resort bookings as large as 45 people. 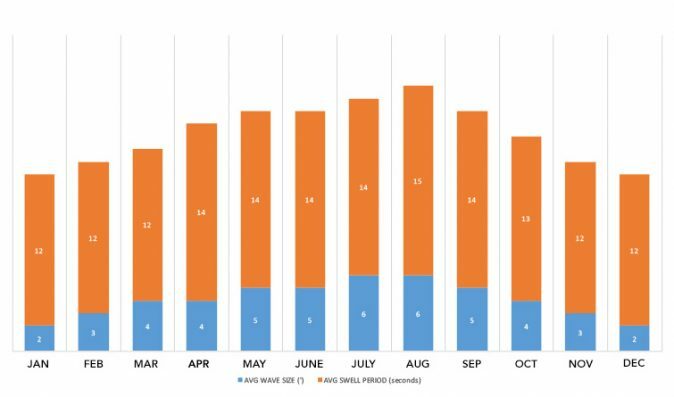 However, in the interests of sustainability surfer numbers are regulated with the number of surf passes sold each week being limited to 20 or less. Las Flores Surf Club’s pride is its signature break “Las Flores” — a world-class, 300-meter-long, right-going freight train that forms outside the point and peels across the cove up onto the sand just meters from the front of the hotel. 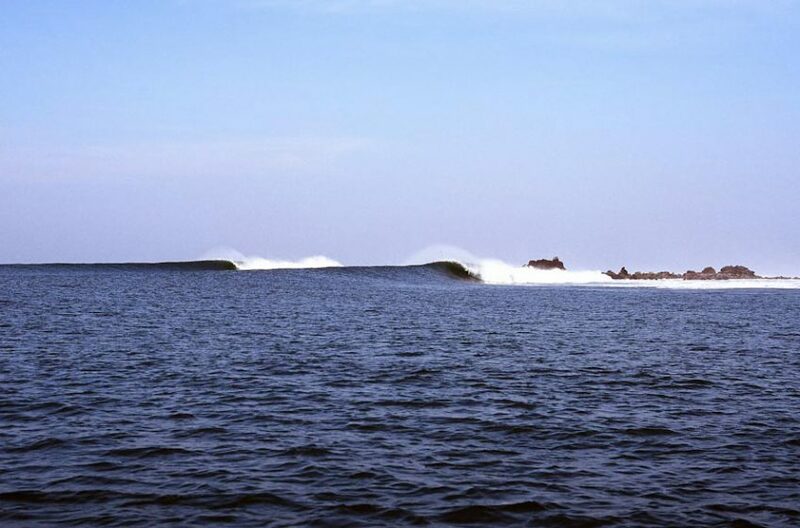 The epic location of the Las Flores Resort directly in front of the wave is without rival. In combination with the beachfront hotel’s modern facilities and amenities, panga fleet for surfing and fishing the area, in-house surf school and the personalized service of their surf guides and staff, the result is practically unprecedented in surf travel. Las Flores is located approximately 150km SE (2 hours drive) of the international airport and is accessible by modern paved roads which are some of the best in Central America, allowing direct transit here at highway speeds. Getting here is easy. El Salvador’s Comalapa Airport (SAL) is the hub for Avianca with nonstop flights from all major US cities, Central America, South America and Europe. Additional airlines that service SAL include American Airlines, Delta Airlines, United Airlines, Copa Airlines, Iberian Airlines, Aeromexico, and more. 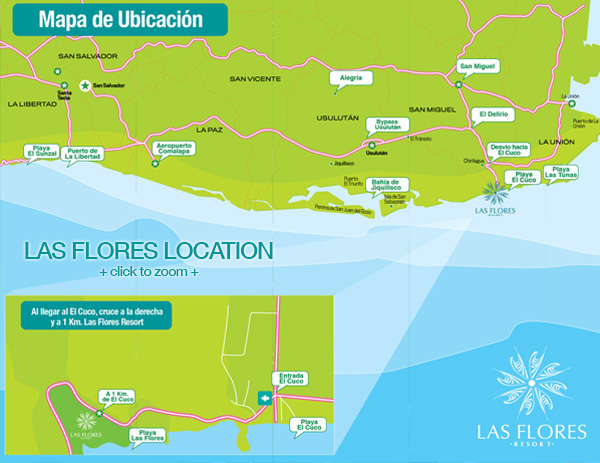 Las Flores Resort is located 2 hours East of El Salvador’s Comalapa International Airport (SAL) in the municipality of El Cuco, Chirilagua, Department of San Miguel. The resort lies in a residential and touristic beach zone located approximately 45min drive from each of Eastern El Salvador’s 3 major cities of San Miguel, La Union, and Usulutan. 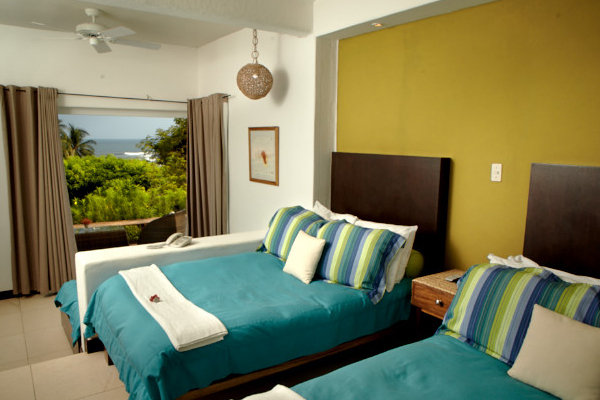 (2) Deluxe 2-bedroom Premium Ocean View Suites. 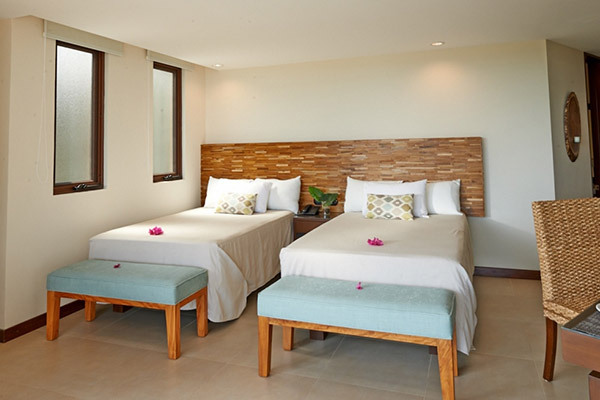 Deluxe rooms and suites have premium views & interior design, stocked minibar, bathrobes, premium towels (620GSM), premium pillows, goose feather mattress top, large LCD TV with premium channels on Sky TV. Airport Transfers: Las Flores only operates airport transfers from 6:00am to 6:00pm daily. If you have a flight arriving after 4:00pm local time or departing El Salvador before 8:30am local time a first or last night airport hotel is required. The Quality Real Aeropuerto is a 4-star hotel located 1km from the airport and offers a complimentary airport shuttle and breakfast included. Passports and Visas: All foreigners entering El Salvador must have a valid passport. El Salvador requires that some foreign passports be valid for at least 6 months beyond your date of entry. El Salvador also requires some nationalities to have a Consular visa. Please check with your consulate for details. Upon arrival Americans and Canadians must purchase a tourist card at immigration for $10.00 payable in cash only. Additional costs at Las Flores Surf Club: Any drinks not explicitly included in the package, Spa, Fishing, Yoga, offsite tours, phone calls. A 10% Service charge will be added to any resort purchases not included in the package. Guests arriving at LFSC prior to check-in time will be provided secure storage for luggage and surfboards and enjoy use of all facilities until their room is ready for check-in. Las Flores Resort will not accept any check-in after 9pm. Airfare: Packages do not include airfare. Hotel facilities include pool and sundeck, swim-up bar, jacuzzi, air-conditioned lounge, business center, outdoor lounges and hammocks, children’s playground, landscaped gardens and walking trails, surf shop, surf school, surfing and fishing panga fleet, oceanfront yoga deck and signature Las Flores SPA. Directly in front of the hotel is the Pacific ocean and one of the most beautiful black sand beaches in Central America. 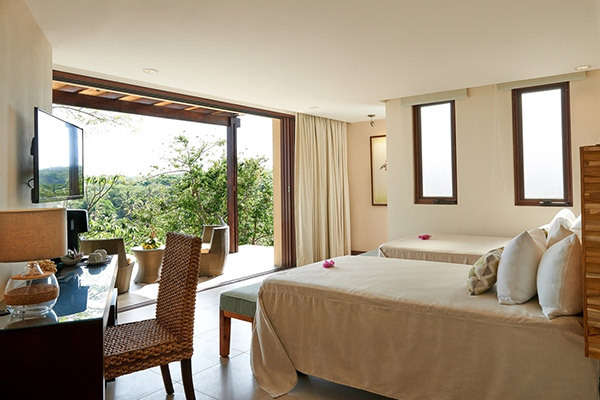 The Las Flores Resort team spoils you with a high level of personal attention to provide you with a relaxing and rejuvenating experience—all for a tangible and down-to-earth economic value. Our bilingual management, front desk staff and surf guides are at your service to meet your every need while at Las Flores Resort. All rooms and suites include A/C, electronic key access, IDD phone, Safe, Plasma Sky Satellite TV & DVD player, WIFI, coffee/tea maker, and daily maid service; designer bathroom w/hot water & amenities kit, shower dispensers of Shampoo & body soap, sink dispensers of soap and hand cream, 2 organic soaps, towels (body,hand and face). *Child is 12 years or under. 13 years or older is considered adult. Description: Ocean/surf views. 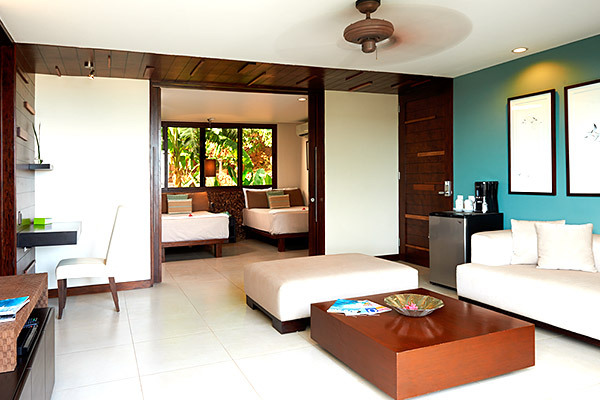 Living area, ocean bedroom with 2 double beds, 2nd bedroom with 2 double beds, 1 bathroom, balcony. Description: Ocean view. 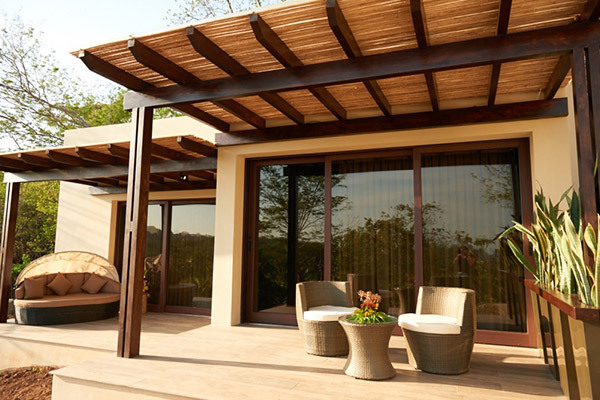 Located above the swim-up bar and jacuzzi and features a private balcony. Regulars’ favorite. Please Note: Executive Rooms Premium Ocean View #14 and #15 have premium views & interior design, but not the other deluxe amenities listed. 435 interior Sq. ft. + terrace of 103 sq.ft. Description: Ocean view, terrace, work area/desk. 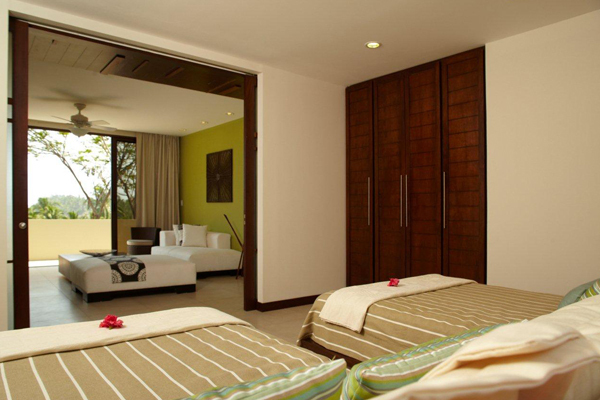 Description: This is the largest suite in the resort at 1079 sq.ft. with commanding ocean and surf views of the point. 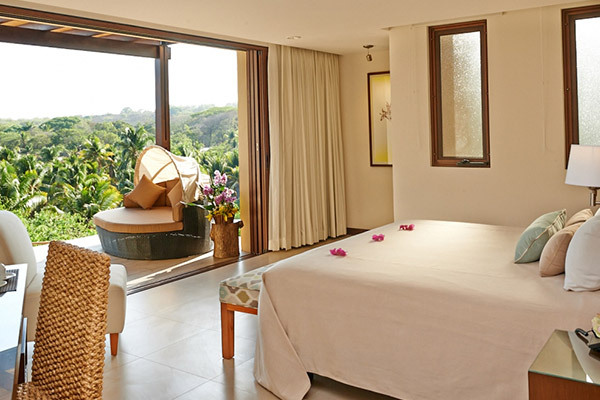 It contains 2 independent suites each with their own luxury ensuite bathrooms, one Master Suite with ocean view from the bedroom, and one Junior Suite. 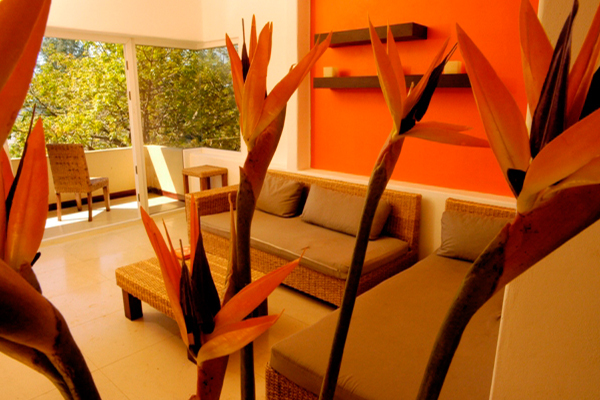 The suites share a common living area and balcony. Description: Stunning ocean/surf views. Master bedroom, 2nd bedroom. Spacious luxury bathroom with locking connecting door to each bedroom. Bathtub. 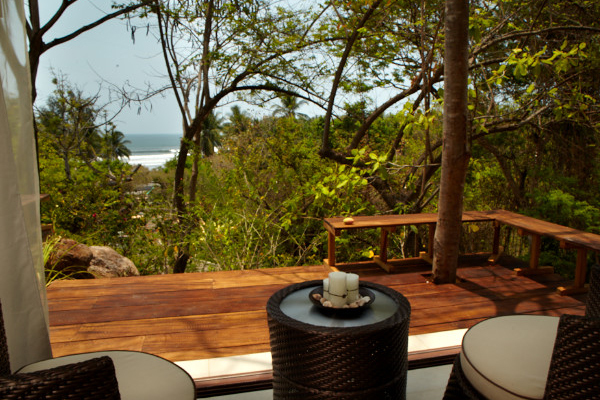 Description: Elevated ocean, surf & mountain view with terrace, desk, sitting area & design bathroom w/rock garden. LCD Smart TV. Deluxe room amenities including LCD Smart TV. Optional connecting door to #14. Description: Elevated ocean, surf & mountain view with terrace, desk, sitting area & design bathroom. Optional connecting door to #12. Description: Elevated ocean, surf & mountain view with terrace, desk, sitting area & design bathroom. Optional connecting door to #16. Description: Elevated ocean, surf & mountain view with terrace, desk, sitting area & design bathroom. Deluxe room amenities including LCD Smart TV. Optional connecting door to #15. LA DIABLA : A 26ft custom superpanga w/ Center console, side bench seating with leather cushions, carpet, roof, VHF radio, ice chest, and powered by a 115hp Yamaha 4-stroke engine. LA COLACHA : A 24ft custom superpanga w/Center console, seating with leather cushions, carpet, roof, VHF radio, ice chest, and powered by a 90hp Yamaha 4-stroke engine. LA CHATITA : A 24ft custom superpanga w/ Side console, side bench seating with leather cushions, carpet, roof, VHF radio, ice chest, and powered by a 75hp Yamaha 4-stroke engine. El Salvador has a dry season (November – April) and a wet season (May -October). One should not be deterred from traveling to El Salvador in the “Wet season”. The majority of days in the wet season are fair with occasional afternoon and evening thunderstorms, and the wet season is generally when the surf is biggest and best and glassiest. 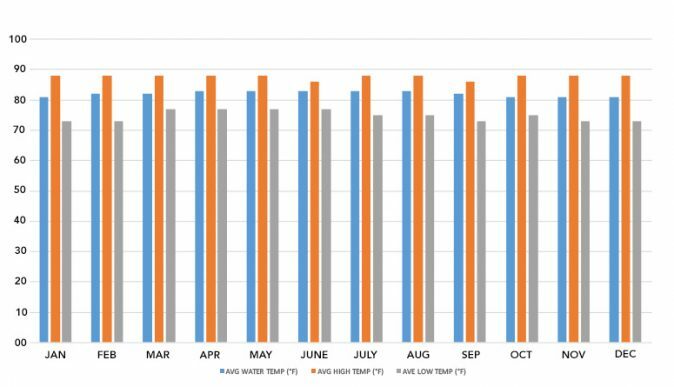 The dry season, or “summer” (November – April), offers beautiful, sunny conditions, but typically has more wind, especially January-March, when the onshore comes up by 9 or 10am, and December – February is smallish and inconsistent. The water temperature is between 78 degrees F and 86 degrees F year-round. Unlike neighboring Nicaragua or Guanacaste, Costa Rica, El Salvador does not get the strong local offshores that cause upwelling, and El Salvador water temperatures are among the warmest in Central America. The air at the coast is hot and humid, in the 80’s and low 90’s generally. Strong sun protection is mandatory. All Rates Include 3 Meals American Plan/ Semi-Inclusive*and Per Person. * Kids package includes accommodation in parents’ room, 3 meals per day with lunch selections form the kids’ menu, drinking water and juices. Managed by surfers for surfers, Las Flores Surf Club’s pride is its signature break “Las Flores” — a world-class, 300-meter-long, right-going freight train that forms outside the point and peels across the cove up onto the sand just meters from the front of the hotel. 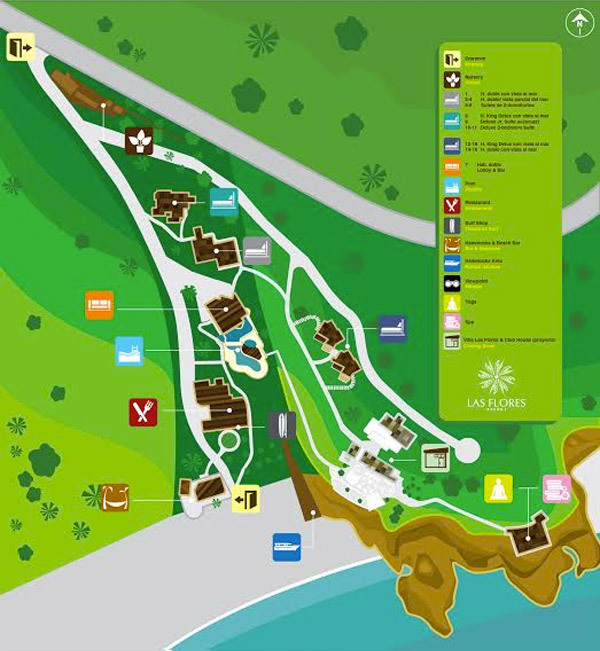 The epic location of the Las Flores Resort directly in front of the wave is without rival. In combination with the beachfront hotel’s modern facilities and amenities, panga fleet for surfing and fishing the area, in-house surf school and the personalized service of their surf guides and staff, the result is practically unprecedented in surf travel. The East coast, contrary to belief, is not the Caribbean coast, in fact EL Salvador has no Caribbean coast only a Pacific coast. Because of the El Salvador coast’s due south orientation the country is divided into 2 regions, “El Oriente”, East, and “Occidental”, West, a.k.a “La Libertad”. 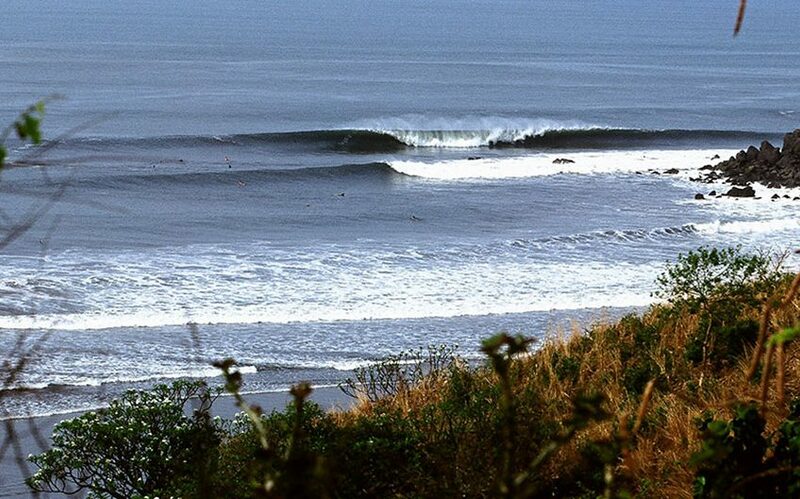 The East coast of El Salvador gets the same swells as the West coast and La Libertad. These swells are generated by storms in the Southern Hemisphere and occur with regularity from March-November. Average wave heights are 4-8 ft on the face, with bigger days to 10-15 ft faces possible, and rarely if ever under 3 feet. The consistency is 90% or greater. 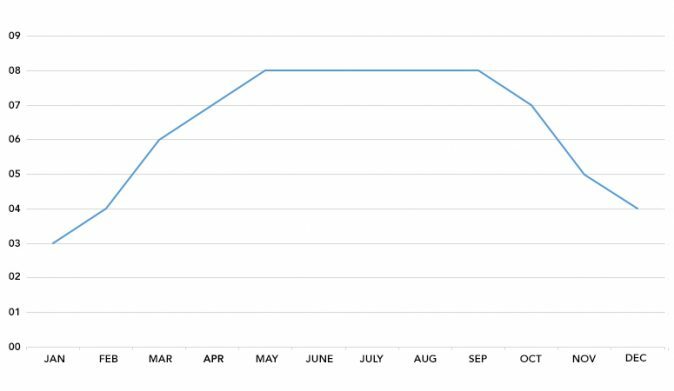 December-February still breaks but is less consistent, 1-3ft mostly, with days to 5 ft possible. This season offers sunny skies and pleasant conditions however strong side-onshore winds are common (ideal for kitesurfing). 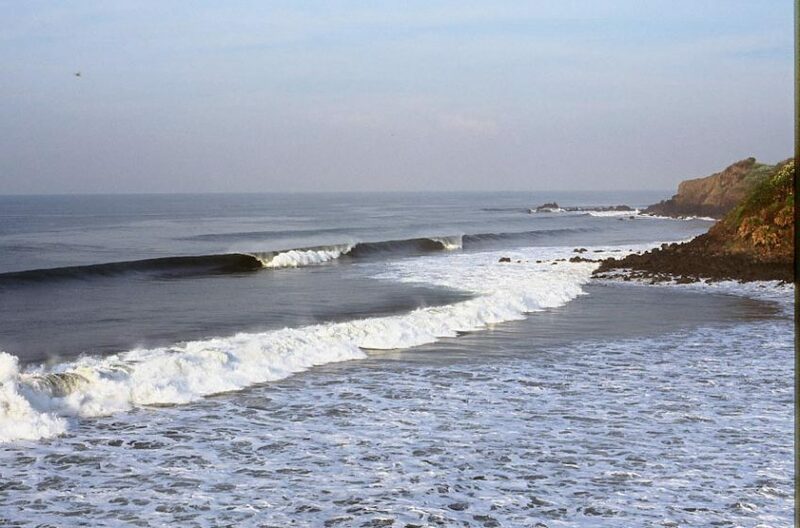 The main draw here are 5 righthand pointbreaks located along a 10 mile stretch of rugged, mountainous coastline. Most famous of the breaks are Las Flores and Punta Mango. Besides these 2 waves there are at least 3 other quality points in the region. Though waves up to double overhead are common, gunny boards are generally not needed. 5’10” to 6’6″ thrusters are ideal, with a 6’8″ or 6’9″ rounded pin for the heaviest, low tide sessions. Funboards, longboards and fish also work well in these sometimes machine-like pointbreak conditions. Very consistent right point break. It is a sand point directly in front of the hotel that breaks mechanically with a hollow takeoff at low tide (softer at high tide) and very long rides up to 300m. The wave has many personalities depending on the swell size and tide. 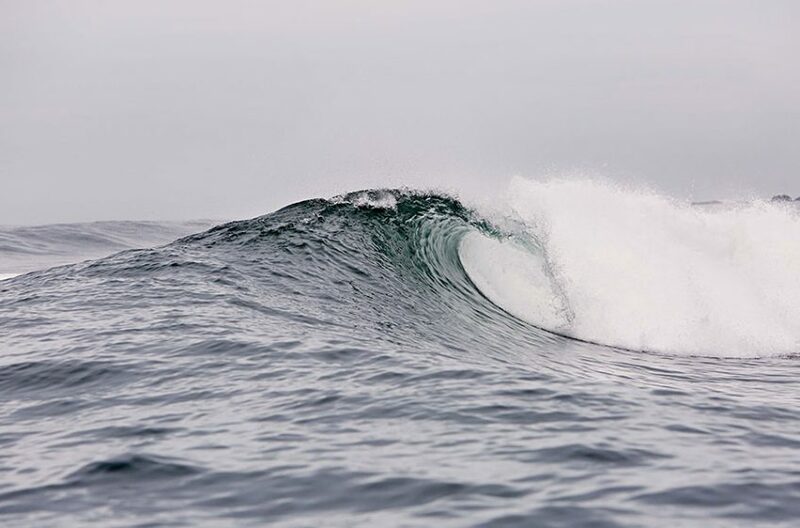 On swells of 6-8ft (face heights) or bigger and lower tides it is a challenging wave for experienced surfers. It has been compared to Jeffreys Bay and Bells. 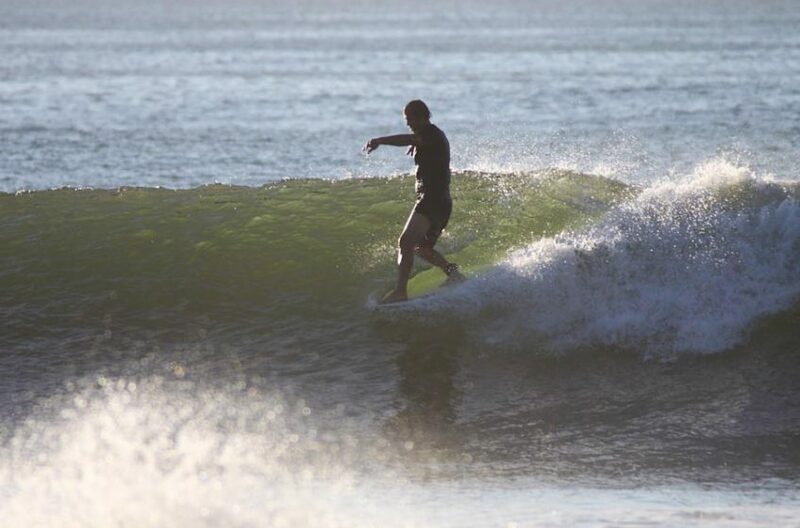 On small to moderate swells of 3-5 ft (face heights), or fuller tides, Las Flores is a classic sand point break, super fun on a shortboard, fish, or longboard, with long open faces and wackable wall sections. The outside will shut down on a full high tide in small to moderate swells and the wave shifts to the inside beachbreak. On big swells the outside works on all tides, and high tide will tend to make the wave more forgiving on the macking swells. 300 m West of Las Flores. This right point works best on a low to mid tide, and a 4-6 ft swell. Vaca is a hollower, critical, shorter wave than Flores. Punta Vaca can be a great option for the experienced surfer looking for heavy takeoffs and tube rides, and can provide crowd relief if the point at Las Flores is congested. 1 km West of Las Flores. This righthand point works best on a low to mid tide, and a solid 4ft+ swell, but can also hold big swells. The wave breaks in deepwater with a steep but forgiving take off and offers long lined up rights with 200m rides when on. The wave face is very carveable but steep, with rocks. Safest access is by boat due to treacherous entry and rocks on the inside. 15 min. West of Las Flores. Access: boat only. Powerful right cobblestone point break w/200m rides when on, machine-like. It is has a hollow take off with a serious barrel at size AND a hollow inside section. It works on a 3ft+ swell and all tides, but 4-7 ft SW is best. Closes out over 8 feet. Reef booties are recommended but not mandatory. The hollowest wave in the region, but also the most wind sensitive. Experienced surfers only even when small, due to currents and shallow inside rocks. The wave has become popular and is sometimes semi-crowded w/3-4 boats and 15-20 surfers at peak hours. Another right point. Accessible only by boat. This wave is like an inferior Las Flores. Low to mid tides best. Cannot handle much wind. Always uncrowded. A hollow beachbreak in front of the town with one distinct peak, favoring lefts. Usually when it is this good the point is better, but check it anyway. Sometimes it is good when the point isn't and can work on a higher tide, offering a scrappier alternative.